This pie is a really nice combination between a fruit tart and a traditional pie. When I saw the photo of this on Chemist in the Kitchen, I knew I had to make it for the Fourth of July. Part of the fruit is cooked down, and mixed with the fresh blueberries giving this a great texture. My husband is a berry pie aficionado and often complains that most blueberry pie are too sweet. Keeping most of the berries whole allowed them to keep some of their natural tartness. This was a great recipe, and would be perfect for any summer weekend, especially served with vanilla ice cream. Preheat the oven to 425 degrees and roll out the pie crust. Shape to fit pie plate and chill for 5 minutes before baking. Bake for 20 minutes lined with foil and filled with pie weights or dried beans. Remove the foil and poke wholes in the bottom with a form. Bake additional 5-10 minutes until golden. When slightly cooled brush the bottom with egg white. For the filling: boil 1 cup of the blueberries and 1/2 cup of water until the blueberries burst. Add the lemon zest, sugar and simmer. Dissolve the cornstarch in water and stir in along with the lemon juice. Return to a simmer. Remove from the heat and fold in the additional 3 1/2 cups of blueberries coating them in the mixture. Pour into the pie crust and allow to set for a few hours before serving. What a delicious looking pie! I am so in love with blueberries! Jillian, your gorgeous photos prove what is the proverbial theory of cooking and baking, fresh and simple is always the best, and your pie is perfection! Beautifully done! What a beautiful pie! The color is amazing. I would have loved a piece of this, especially if it wasn’t too sweet like you said! ACK! No one has ever made one of the recipes I’ve posted and put it on their blog! I’m so glad it turned out well for you, and the photos are really lovely! Kudos on making your own crust…I’m way too lazy ;)! I made this recipe, but used lime juice, which is slightly sweeter and has an unusual tang. I highly recommend it either way. 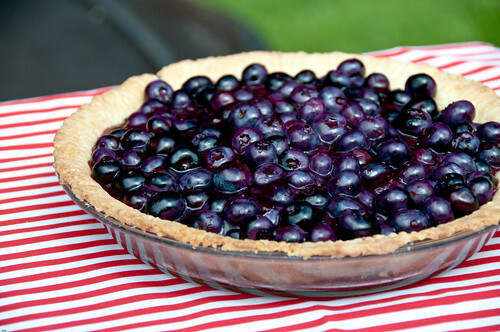 What a gorgeous blueberry pie!! Oh man this blueberry pie looks amazing! 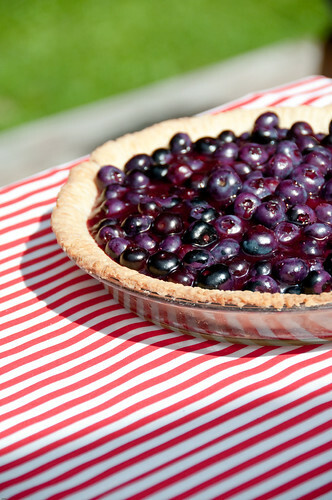 Your blueberry pie sounds delicious! I love the mix of fresh and cooked! Great way to intensify the berry flavor. Beautiful photos. I bet this is delicious with some ice cream (and without). Yum. This has got to be the best blueberry pie recipe I have ever tried. I made two for a family gathering and every one was raving about it. It still comes up in conversation. Thank you so much for sharing this Jillian. It has gone into my cook book. Cathy- Thanks so much for your comment. I love that this pie still comes up in conversation! !